Pretty much everyone is familiar with the Rule of Threes in photography. And when you use the Crop Tool in Lightroom, it gives you an outline of the rule with which to crop your images. But are you familiar with the Golden Triangle? Or the Golden Spiral? Lightroom is, and here’s a great tip. Click on your Crop Tool, and then hit “O” (that’s the letter, not the number). With each press you’ll cycle through each of the six Golden rules for composition. Hold down the SHIFT key and hit “O” and you’ll change the orientation of the overlay. The Rule of thirds is, in my opinion, the most useful. But the Golden Triangle can be helpful in determining where to put your point of interest with the composition has a lot of diagonal lines. Similarly, the Golden Spiral is especially helpful when you have a lot of negative space, or empty space in your image. Now go back to the image at the top of the post. 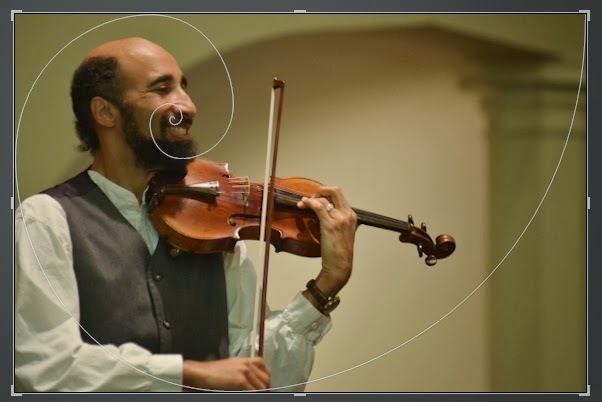 This isn’t the perfect example, because ultimately you’d like more of an angle following the arc of the spiral, but the top of the violin to the elbow/hand (continuing on thru the bow arm) accomplishes some of that arc. This feature seems to exist from version 3 forward. Kind of amazing what they hid away in the program, huh?